[New for 2016] I don't think we've covered a North Star treat here on the blog yet. 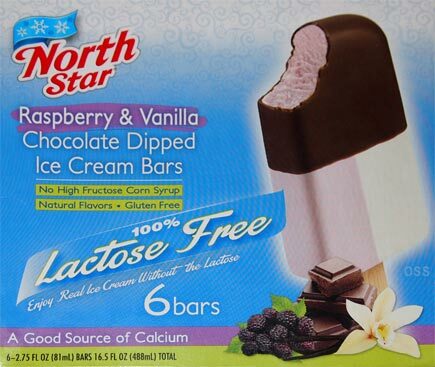 North Star is a part of the Prairie Farms Dairy family (the people behind Peeps Milk) and I can only really find a decent selection of their stuff at Wegmans (though a few things have been popping up at Market Basket). I'll admit that they have an air of "budget friendly" to their packaging and their stuff seems pretty standard fair, the same kinds of things we might see from Good Humor or Blue Bunny, but something caught my eye on my last trip and I decided to give them a try. 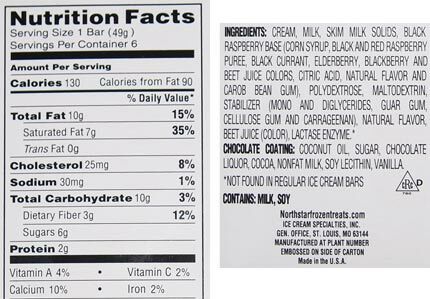 The big "100% Lactose Free" probably caught your eye first and like many treats, "lactose free" really means that it includes enough lactase enzyme to counteract the lactose naturally occuring in the ingredients. Oh, this product also comes in chocolate & vanilla and a vanilla caramel latte versions that are also half dipped, as well as a chocolate fudge version that is not dipped. Will I be going back to try the other versions? Let's find out. So I inhaled the first one while mowing because when you are tired and need calories, nothing beats being a few feet from a chest freezer full of snacks. What did I notice in my two minute break? The chocolate shell is quite thin but stayed stuck to the bar which was good. The ice cream tasted fairly normal, both flavor and texture wise, if not a little something to it. The only thing that I really thought about was basically debating who this treat was aimed at. If they are trying to give the lactose intolerant crowd something different, that's cool, but why go half dipped? Half dipped always makes me think about diet treats. Or maybe they are going for the non-treat crowd, those who don't love the chocolate of a Magnum bar and instead want just a hint of chocolate. Oh well, it's something to thing about. On Second Scoop: Digging further in to specifics, the shell has a decent chocolate flavor, something akin to other chocolate covered bars though overall mild. The vanilla side is very, very mild. At first, I was getting pretty decent flavor off the raspberry side, but as I continued, the "vanilla" seemed to be washing the flavor away. The ice cream is pretty soft and quick melting, and there is a bit of.... well, it feels like a light ice cream I'll say, leaning towards something you might expect from weight watchers, that kind of funk to it. These aren't bad, but I'll have a few more before releasing this review. At least the treat actually looks like the one on the box! This reminds me of another half dipped product you guys reviewed at one point, maybe Skinny Cow? Went through the archives out of curiosity and it looks like Breyers Smooth & Dreamy did it first, followed by Weight Watchers. More recently Yasso and Fruit dips have done the half dip thing.